That is so cute!!!! I love ornaments hanging for decoration. It so cheap and easy, but looks great!!!!! I want to buy some big huge silver one to hang somewhere in my house. I will probably decorate for xmas more next year. Deeds, you got a cat? 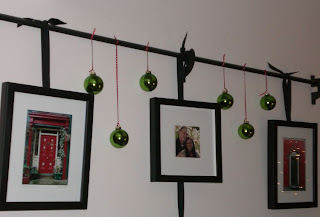 The the way you have the pictures displayed and how you added a Christmas touch!